The Jolly is a mobile stair climber which allows the user to travel up and down the stairs in the comfort of their own wheelchair. 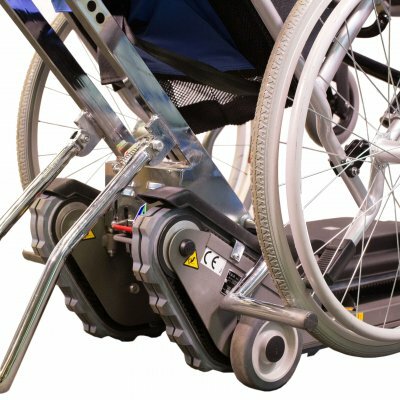 Designed to manage the majority of staircases, it is compatible with electric chairs, wheelchairs with tilting or movable backrests and even pushchairs. Installation is not required. 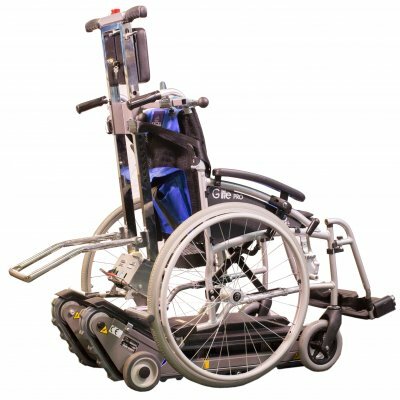 Once the wheelchair is attached to the tracked base , a trained operator can simply manoeuvre the user up and down the stairs in a smooth motion. 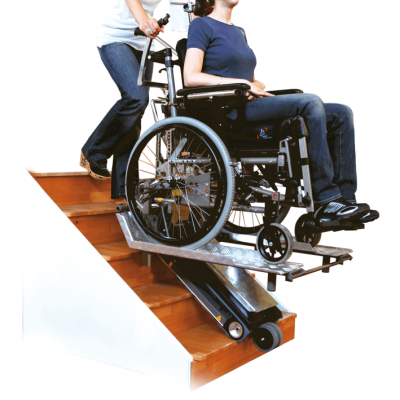 The unique design keeps the user at a level position on the stairs, instilling confidence and trust at all times during operation. 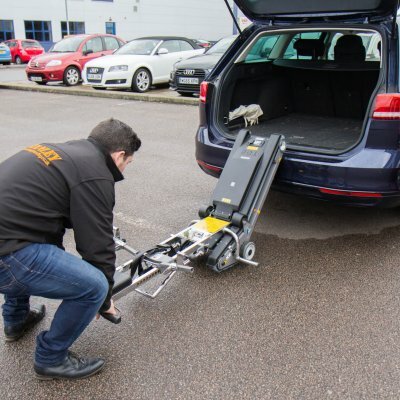 The light stair climber frame can be is easily dismantled to fit into a car or ambulance. For heavier weight capacities, the wheelchair stair climber can be fitted with a strong metallic ramp or large base plate. 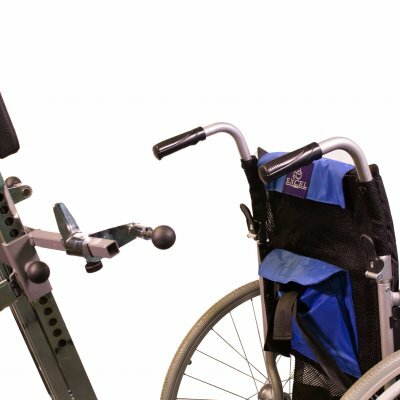 The stair climber, which enables users to travel in the comfort of their own wheelchair, is transforming the lives of many. What is extremely beneficial is that the unit is highly portable – a feature than many equivalent products do not have. The Jolly can easily be transported in the back of a vehicle once folded down by the operator. Simply dismantle the Jolly into the two constitute parts and load the machine into the car or ambulance. For more information about how he Jolly can improve your standard of living, contact a member of our sales team on 0800 298 2980.